With the way the Panther volleyball team started on Tuesday night, an easy sweep looked to be in the cards in a pair of league matches at home against Perry-Lecompton. It may not have turned out to be that simple, but Royal Valley did hold on and hold off some furious rallies by the Kaws to win both matches in Hoyt. “It feels really good to win and get the sweep, though we kind of made it harder on ourselves than we had to,” RV coach Denise Visocsky said. Royal Valley was cruising to start the game, as the Kaws suffered error after error and almost gave the first set to the Panthers outright. In fact, a Perry-Lecompton error gave Royal Valley the set point as the team never looked back from an early 8-2 lead. The Kaws quickly righted the ship both offensively and defensively and the Panthers suffered from a few errors of their own in the second set of the first match, but it was never enough to put the game in doubt, especially with sisters Hannah and Sarah Beam coming up with big play after big play for the Panthers. “Sarah really bought in and started really pounding on the ball, which we haven’t seen a lot of that yet, so it was nice to see her step up in that role Tuesday night,” Visocsky said. While Kate Hanson got the clinching kill in the final set of the first match, Beam would come up big to close out the night. She finished with 11 kills to go along with seven digs and two blocks, with a lot of that production coming in the final match. That final match was a doozy, too, as the Panthers let down a little early after the relatively easy first win, but gathered themselves on the way to the sweep. Early on in the first set of the second match, Royal Valley’s timing was off and that was to the team’s detriment. Whether hitting out of bounds or floating some passes over to set up the Kaws’ offense, it played into Perry-Lecompton taking an early lead. At every step, Perry-Lecompton seemed to maintain a slim lead as the Panthers were taking one step forward and two steps back. The momentum finally shifted when one of the senior leaders, Hannah Beam, stepped back to serve and held it for six consecutive points to give the Panthers an 18-17 lead late. “Hannah has been our stable one, our solid one. She’s been so consistent. She doesn’t get really emotional. She just goes out and does her job and we know what to expect from her day in and day out,” Visocsky said. Beam has been adjusting to a more defense-oriented role on this team. Visocsky noted that stemmed from a switch to get the team’s best servers up earlier in matches, leading to Beam playing more defense recently, and she has gone with the flow. 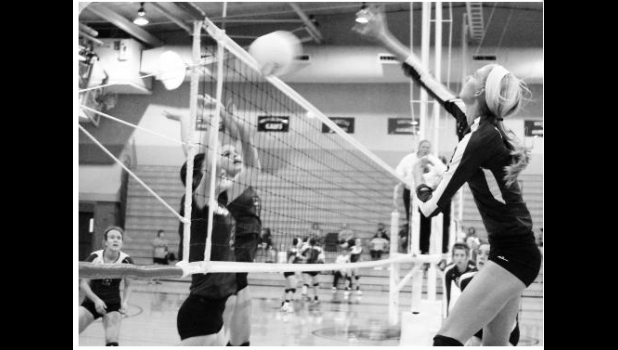 On Tuesday, she led the Panthers with 18 digs and also had five kills and five aces in the two matches. While Hannah Beam set the Panthers up, it was Sarah Beam who came up with the finishing blow. As the teams rotated between perfectly placed shots and errors down the stretch, keeping the set going, Royal Valley eventually got the advantage and Beam delivered with an emphatic kill to clinch the set. The second set looked to pick up where the first one left off, but Royal Valley gradually pulled away as the offense adjusted from some setbacks in the first set in order to close out the match. “We were able to get some good hits and some key blocks. I think we just stayed on the attack instead of leaning back and thinking, ‘oh, this is in the bag,’ which we sometimes do. Then, we just kept pushing on the gas pedal to finish all the way,” Visocsksy said. Perry-Lecompton reverted to its form to start the night, giving away some errors to clinch the match for Royal Valley, and the Panthers stayed strong defensively. Visocsky said RV is continuing to evolve into a scrappy team and Jaycee Worrell was a big part of that on Tuesday, especially in the second match where she had the majority of her 10 digs on the night. Overall, Visocsky said the team worked well together on Tuesday as the team’s communication skills continue to improve and the players continue to get more comfortable with the rotation, which the coach said is giving them some confidence. The Panthers battled through some adversity on Tuesday, some of it self-inflicted, and Visocsky said she is hoping her players learned their lesson and see what they need to bring to each league match from her on out. “We can’t underestimate any team. There’s always something that’s going to hold us up, so we have to make sure that we push hard all the way through and don’t underestimate any team in our league,” Visocsky said. Royal Valley will have to keep that in mind as the team hits the road to take on a competitive Sabetha squad on Thursday. Matches will start at 5 p.m. Kills: S. Beam 11, Hanson 7, H. Beam 5. Assists: Pruyser 10, Bryan 13, Burns 4.